According to my trusty book of symbols the Rainbow in Greek Mythos was associated with the Goddess Iris. Iris was regarded as a messenger (primarily from Hera); her symbol often seen between sea and sky (or dam and sky in this instance). I hope you find this image almost as pleasurable as I (and my co-conspirators) did while we were making it! 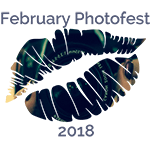 This entry was posted in FebPhotoFest2018, Wicked Wednesday and tagged exhibitionist, goddess, Indigo, Iris, messenger, rainbow, sensual pleasure. Bookmark the permalink. Indie, this is one of my favorites of yours! Especially the full shot that shows your hands! the shadow effect is fantastic and the rainbow glow through your legs focuses the attention. You look like a goddess invoking the storm. Really really beautifully done! I love this. Such a clever shot and so fortunate with the light. Simply brilliant. Thank you KW. I love it too – I plan to get a copy of it blown up to put on my wall. There are a couple of others from this photoshoot that I’d like to do that to as well. Going to run out of wall space fast! I love the abundance of the images, especially the second! The placing of the sun is brilliant too! My photographer and I worked hard to get that light in place before the sun went down glad it’s appreciated! I was! It was a glorious night by my standards, probably a little mild for sun worshippers such as yourself! My photographers were working very hard to place the sun – just so!